Haiti Tech Summit- Royal Decameron Beach Resort, Haiti: Deemed the Davos of the Caribbean, the 3rd annual gathering returns on June 20-22nd. Each year Haiti hosts 100 global speakers and close to 1000+ global ecosystem influencers with the mission of turning Haiti into a major tech hub by 2030. Previous headline speakers include the President of Haiti, Ben Horowitz-investor in Facebook, Jack Dorsey-founder of Twitter, and Vicky Jeudy – celebrity actor from Netflix’s Orange is the New Black. RSVP via HaitiTechSummit.com. Ghana Tech Summit- Kempinski Hotel Gold Coast, Ghana: As the largest tech gathering in West Africa, the summit’s 2nd annual program will return on December 13, 2019 with 5000+ participants. With Ghana being Africa’s fastest growing economy, the summit featured keynotes from Billionaire VC Tim Draper, President of the Diaspora Office- Akwasi Awua Ababio and Deputy Ministry of Communications George Andah. RSVP via GhanaTechSummit.com. Future Tech Week – New York City, USA: In partnership SAP Next Gen, the first global series of Future Tech Week will launch from New York City on May 14-17,2019. The initiative includes a week-long series of tech gatherings on future tech topics which includes VR Tech Summit, Blockchain Tech Summit, Ai Tech Summit, and Nano Tech Summit. RSVP via vrtechsummit.org, blockchaintechsummit.org, aitechsummit.org, and nanotechsummit.org. Space Tech Summit – Silicon Valley, USA: In partnership with Draper University, the 2nd annual Space tech Summit will take place to celebrate the 50th anniversary of the moon landing on July 17, 2019. RSVP via SpaceTechSummit.org. Future Tech Summit- Dubai, UAE. To accelerate humanity’s success with the Sustainable Development Goals, Future Tech Summit launches with a lineup of 100 global speakers and partners in Dubai on September 5, 2019. The global gathering serves to centralize leading social impact applications of future tech solutions that leverage Ai, VR, Nano, space and blockchain technologies. RSVP via Futuretechsummit.org. Her Future Summit- London, UK. To Accelerate Humanity’s success with #5 of the Sustainable Development Goals- Gender Equality, Her Future Summit in partnership with SAP Next-Gen Launches with a Line up of 100 Global Speakers and Partners in San Francisco, New York and London. Her Future Summit will be the world’s most exclusive event featuring tech investors, entrepreneurs and influencers creating or leveraging platforms to advance women. RSVP via Herfuturesummit.org. Accelerating Africa into the Future: via the largest tech tour on the continent. 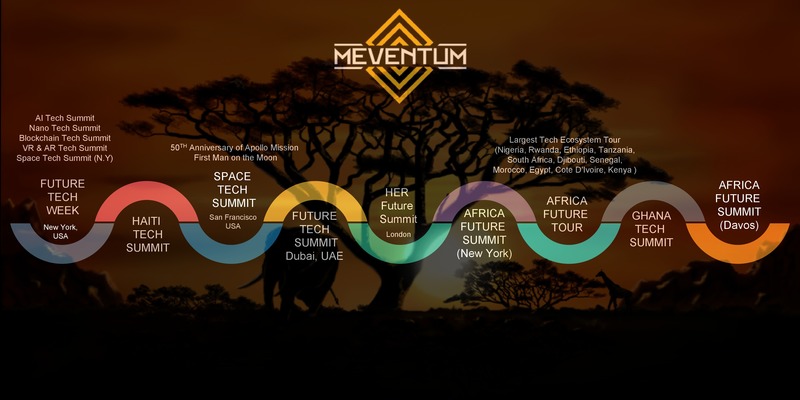 Meventum ends the year with Africa, centralizing the conversation around how the world will transform with Africa as a core hub of innovation. Africa Future Summit 2019 – New York City, USA – The 2nd annual program brings together hundreds of entrepreneurs, investors, pioneers, and creatives under one roof to address the greatest exponential technologies launching across the continent and its future role as the world’s final tech frontier. RSVP via africafuturesummit.org. Africa Future Summit Tech Tour 2019- To accelerate developments within Africa’s tech ecosystem, Africa Future Summit is to host the largest tech tour across the continent from October- December 2019. The tour will target 10 countries such as Nigeria, South Africa, Kenya, Ethiopia, Egypt, Morocco, Senegal, Rwanda, Tanzania, Djibouti, and Cote D’ Ivoire. The summit will end with the culminating Ghana Tech Summit featuring 100 global speakers on December 13, 2019. This will be the largest tech tour across the continent, welcoming close to 500 speakers and 5000+ guests across the tour. The Africa Tech Tour aims to highlight the continent’s network of entrepreneurs, investors, pioneers, and creatives of tomorrow. Each country will feature it’s on combination of onsite workshop training, networking round tables, live Q/A sessions with speakers and sponsors, attendee spotlight features, exhibitor showcase demos and VIP networking dinners and after parties. RSVP via africafuturesummit.org/tour. For more information on tickets, sponsorships and partnerships, please email the team at info@meventum.com. 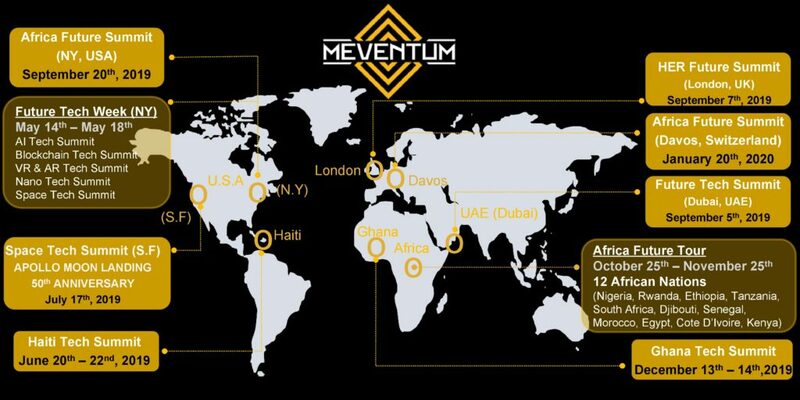 About Meventum: Meventum is a media company that manages the fastest growing community of tech pioneers with purpose. With a mission of preparing humanity for tomorrow, the media platform changes the narrative around emerging markets by galvanizing thousands of investors, entrepreneurs, politicians, celebrities and influencers in untapped markets around the world to design the future.